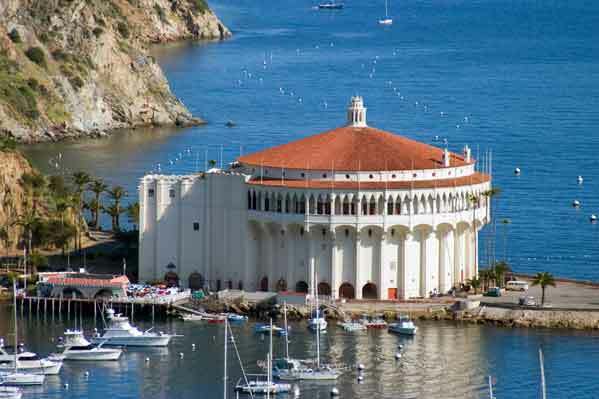 Zip on over to Catalina Island on the Catalina Express from Long Beach. If you are luck, the Captain will slow the ship down as he announces a school of porpoises zipping in front of the boat. Looking out the windows, one can view a multitude of these beautiful mammals leaping into the air and playing near the wake of the ship. Once on the island, walk or catch a ride to the Descanso Beach Activity Center to experience a thrilling Zip line adventure. It’s the only zip line court in Los Angeles and Orange County that features five separate zips with a 440-feet drop. After a twenty-minute lesson on how to “zip,” guests receive a helmet and harness before boarding a van for a short ride up 500 feet above sea level to Hog’s Back. It’s at the entrance of the Island’s Interior gate. This is the first of six wooden platforms on the course. I volunteered to be the first “zipper” in my group. Looking out at 4,000 feet of steel cables, my hands started to sweat. With the encouragement from my fellow “zippers,” I took a running jump off the platform and soared in the air. I was told I might reach speeds as high as 45 miles an hour zipping if I put my legs in a horizontal position. I soared from one platform to the next with my eyes open, taking in the ocean views. As I continued to relax a bit, it was quite fun. I now know what birds see while soaring above the Island’s canyons and mountain range. The longest zip is 1,045 lineal feet. Eventually I zipped down to where we started. The entire adventure takes about 2 hours. Can we visit tide pools at catalina island. Not really Ted, however the glass bottom boat and submarine ride offer a glimpse of Under the Sea.